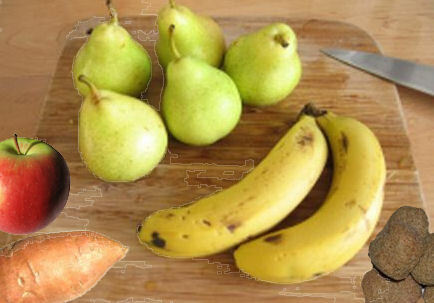 Peel fruits and put them in a blender together with 16.9fl oz bottle of water. Blend until mixture is smooth. Add 4 to 6 monkey biscuits and one medium sized baked or micro waved sweet potato. Blend until mixture is smooth. Put half of the mixed product into a holding container. Take remaining blend and add water until there is a funnel in the blender. Add Cereal to thicken the monkey smoothie. Take product in holding container and add to smoothie in blender. If there is still a funnel, add more cereal until funnel is gone. I have substituted the water for unsweetened juice also, especially if I am making popsicles.